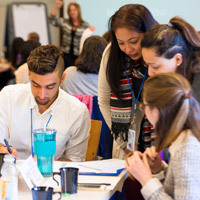 Starfish, an advising and retention solution, is returning to Webster University Feb. 27-28, 2017, for an additional visit and series of presentations. This is one of the vendors that visited in November 2016. Your input and feedback is very important in this process as the University seeks to identify the option that enables us to best proactively serve and assist our students. A cohort of 26 student leaders from Webster University campuses in St. Louis, Geneva, Vienna, Leiden, Cha-Am and Accra have been selected for the Webster University 2017 Global Student Leadership Summit (GSLS) to be held June 7-10, 2017 in Vienna. Webster University will host three vendors on campus in November to review potential student case management systems. The vendor presentations to the global network will allow the University to identify a product that could best holistically document our engagements with students, allow for shared advising notes, provide a new at-risk referral system and provide predictive data analytics to more proactively serve and assist our students. 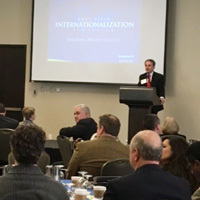 Julian Schuster gave the keynote at the Kent State University Internationalization Symposium on April 1, which brought together 150 academics and administrators from universities around the world as well as representatives from the government, nonprofit and corporate sectors. His address, "The Global University: Its Place and Role in Higher Education," focused on the characteristics of a global university and highlighted Webster’s unique history and international footprint. Webster and Kent, a WINS partner, are discussing further collaboration.